Thu., Nov. 29, 2018, 5 a.m. The civilian panel tasked with overseeing conduct by Spokane police is accusing City Hall of blocking access to data in violation of city law. 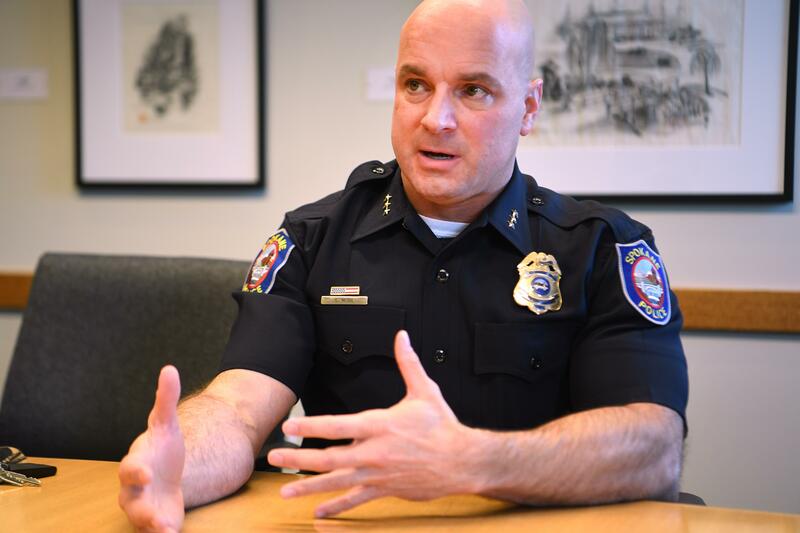 The Spokane Police Ombudsman Commission earlier this month filed a formal complaint with Mayor David Condon against police Chief Craig Meidl, alleging “continuous interference” with the panel’s independence. Meidl said he has received guidance that specific requests from the commission – and from Spokane police Ombudsman Bart Logue – for further access to police records is subject to bargaining with the union representing Spokane police. Logue, members of the ombudsman commission and at least one city lawmaker contend that what is being requested is part of the existing contract with the police union and there shouldn’t be any controversy about handing the information over. The matter has been forwarded to the city’s legal and human resources departments, which are reviewing the city’s laws and will make findings of fact based on their work, said Marlene Feist, a spokeswoman for the mayor’s office. Meidl, in an interview this week, said the department is trying to avoid potential complications in talks with the Spokane Police Guild for a new contract to replace the one that expired at the end of 2016. He said the issue would be resolved in collective bargaining. City Councilwoman Lori Kinnear, who chairs the city’s Public Safety and Community Health Committee, said the ombudsman push may be premature. But the members of the commission argue that the protracted talks are affecting the ability of the ombudsman to perform its intended job. They also say the complaint should not be seen as an indictment of the chief specifically. “It feels like we’re being held hostage because these negotiations just never seem to end,” said Ladd Smith, chairman of the ombudsman commission. The letter to Condon is just one of several recent actions the ombudsman commission, created in 2014 following passage of a citizen ballot initiative calling for increased oversight over the department, has made to assert that authority. At the same meeting, the panel approved filing the complaint, they asked the department’s Internal Affairs department to reopen a review into an officer’s conduct when dealing with a downtown protester at a political event this summer. Commission members ask for two things in their letter: Access for one of Logue’s employees to internal software that will allow her to process complaints, and for one commission member to review unredacted case files from 2016 to study how, and why, officers used force against people of color. The issue was originally raised by Cam Zorrozua, a staff attorney at the Center for Justice, in a letter to Condon and Meidl in late September. The administration responded with a letter that the issue hadn’t been “properly raised” under city law, which requires any concern about the police chief to go through the ombudsman commission in the form of a formal complaint to the city’s human resources department. Logue said that should include his employee’s access to the software, which has been granted to other workers in the past. The issue has slowed the work of the commission, which has received double the number of complaints in 2018 compared to last year. Meidl said he empathizes with Logue and the additional workload the office has received. He attributed the increase in complaints this year to higher expectations from both the public and members of the department. “His office is very busy, he absolutely could use the additional help,” Meidl said. “I would not argue that point at all.” Still, Meidl said, he is bound by the legal advice he’s received from the city’s negotiating team to not push the issue before contract talks have concluded. The police department publishes annual reports on its officers’ use of force, including stun gun deployment, neck restraints and the pointing or use of a firearm, every year. In 2017, 15 percent of use-of-force cases involved a black person, while about 2 percent of the city’s population is black, based on the most recent U.S. Census data. That figure was 18 percent in 2016, and 15 percent in 2015. The mayor’s response to the letter expressing concern about the lack of access notes that all officers receive training on removing bias from policing, part of reforms suggested after the Department of Justice was brought in to review the practices of the Spokane Police Department following the death of a mentally handicapped janitor named Otto Zehm in a 2006 incident at a gas station. Meidl said he couldn’t comment directly on the hesitancy about access to the unredacted case files, but there may be concern about the security of the information should a commissioner leave the panel and no longer be bound by a confidentiality agreement. Beggs has requested that the disagreement over the city law be discussed by lawmakers and top members of the police administration. That is scheduled to occur Monday afternoon at a monthly committee meeting held at City Hall. “I want the police leadership to explain to us why they’re not following the letter of the law. I have not heard directly from them, but I have heard it from lawyers,” Beggs said. Logue said he hopes the complaint will lead to clarity on the role of his office, and the commission that oversees it, moving forward. “I do think we need to have some things figured out, and made absolutely crystal clear,” he said. For his part, Meidl said he didn’t believe the actions by the commission – questioning the conclusion of an Internal Affairs investigation and the complaint about access to data – would lead to damage in the working relationship between the department and the ombudsman. Published: Nov. 29, 2018, 5 a.m.